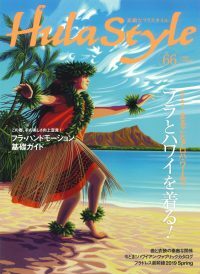 Sutekina Hula Style readers will have access to our advertisers via printed information and through our company maintained homepage. By implementing this system readers will have information accessible to them via internet pertaining to hula dancing and Hawaii. This system will also allow our advertisers to reach hula enthusiasts with current and updated information. Sutekina Hula Style will always feature an article on Hawaii and the island’s outstanding culture and beauty. This special feature will comprise of color photographs and comments which relate to a specific theme. 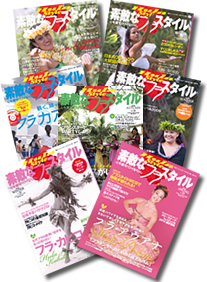 Sutekina Hula Style also feature articles on ordinary people who have become affiliated with hula dancing and Hawaiian culture. We hope this will help prospective learners to feel closer to the current population, and serve as a bridge amongst the two parties. Sutekina Hula Style will feature a directory listing consisting of contact name, address, and a description of the establishment. Also, any studio or school with an advertisement in the magazine will also be introduced in our special feature section Halau Report and any other special feature articles*, as appropriate. Sutekina Hula Style will cover topics such as fashion & jewelry, cosmetics, beauty, cooking, wedding receptions, long & short term vacations, and an introduction to Hawaiian interior and gardening. We hope to reach a wide array of readers by featuring a variety of topics regarding Hawaii. Research data as of April 2004 prepared by Ikaros Publications LTD. The numbers of Hula fans is expanding throughout Japan. This trend originated from the first Hawaiian boom about 40years ago and a moderate but steadily growing Hula market has been established in Japanese since then. Now with the synergy of the recent Hawaiian boom and “Iyashi” or healing boom ( a trend where people seek out things that are physically and mentally soothing ) , the Hula market has become energized and is now attracting a younger generation of enthusiasts in greater numbers then ever. With the objective of finding out more about the prospective Hula market , the magazine ” Sutekina Hula Style ” conducted research on those enthusiasts who participate in hula classes through ” culture schools ” , community centers , gyms , and Hula Halaus throughout Japan. The higher numbers are expected if the medium and small size culture schools and gyms are coverd in this research. In additions , judging from the recent trend of a growing Hula population , it is clear how important the future Hula market will be to Hawaii’s business. In addition to the amount of spending shown above, people who take Hula lessons also contribute to Hula market by purchasing Hula and Hawaii related materials, such as costumes, Hawaiian music CDs, vacations to Hawaii, event participations fees, etc. This data reveals that the Hula market in Japan is a more important market for Hawaii’s business than we had thought. Q: What are “culture schools” ? A: In Japan there are many facilities run by business that mainly cultural classes. These are called “culture centers” and they provide the public with opportunities to learn and experience various cultural activities through classes in liberal education, art, various hobbies, martial arts, exercise studio, etc. Q: What are the Ko-min kan or community centers? A: Community centers are operated by local municipalities to provide places where people in the community can participate in cultural activities or learn something that they are interested in at a low cost. Many public halls and centers throughout Japan are equipped with high tech features and are being used more and more for hula classes as well other cultural activities. A: Gyms are fitness facilities that teach swimming, resistance training. Golf , tennis, and dance. Hula classes are popular as are Jazz dance and ballet.